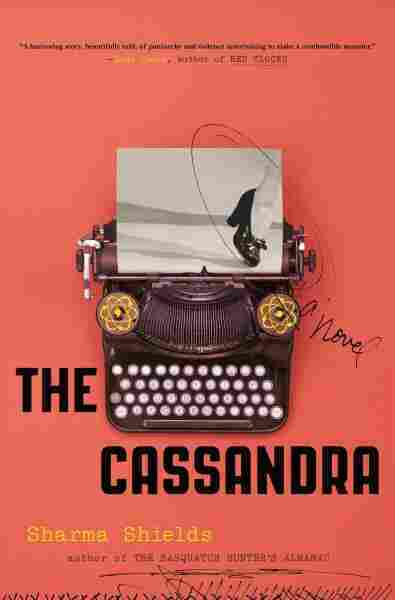 Book Review: 'The Cassandra,' By Sharma Shields Sharma Shields' new novel follows a young woman working at a secretive nuclear research center during World War II. She has terrible premonitions of atomic disaster, but never truly thinks about them. The premise of Sharma Shields' second novel, The Cassandra, is excellent. A young woman named Mildred Groves, tormented by strange premonitions and a manipulative mother, takes a secretarial position at the secretive Hanford research center at the height of World War II. Mildred is delighted to be at Hanford, but her premonitions get worse every day: dying children, faceless burn victims, all the suffering Hanford's mysterious "product" — which turns out to be plutonium for the atom bomb — will inflict. This should be a perfect setup for moral torment, political interrogation, and the philosophical rigor of the Greek myth from which the novel takes its name. Unfortunately, Shields strays far too frequently into neatness and cuteness, and so The Cassandra leaves no questions in its wake. The novel's first and greatest problem is Mildred herself. She's faced her share of challenges, both as a clairvoyant and a woman in a world hostile to female intelligence, but all those challenges have taught her is to try — not too hard, though — to keep her mouth shut. Mildred is overly trusting, overly enthusiastic, prone to internal declarations like, "I had gone from caretaker of Mother to caretaker of the world." In high school, her classmates called her Mad Mildred; at Hanford, the men she works with call her Decent Milly. She's a bit of both, but as a narrator, she's Decent Milly all the way. Her innocence grates even before The Cassandra's ethical quandaries begin to emerge. Once they become clear, it's maddening. This is particularly true because Mildred never succeeds at suppressing her doubts. She works for Dr. Hall, a physicist reporting directly to Enrico Fermi, and she frequently relays her visions to her boss. The first time, when she warns Dr. Hall his product will lead to mass death, he tells her not to flatter herself that dreams have meaning. Mildred claims to know as much, but "the very next moment, despite myself or because of it," warns him one more time, "But it will come true." From here on, Mildred voices truth to power once a chapter. She knows Dr. Hall dismisses her predictions as the poetic ramblings of an untrained mind, but she doesn't seem to care. For Mildred, it's enough to deliver her warnings. She never reflects on what her conversations with Dr. Hall mean, or what they lack. What they lack, of course, is listening. Nobody listens to a Cassandra. This should be an ethical crisis for Mildred: How can she try harder? How can she get her message across? But rather than investing in these questions, Shields focuses on Mildred's attempts to blend in with the other women at Hanford. Only once does Mildred ask herself, "How much would we improve as a human race if we listened to the warnings given to us?" Shields may expect the reader to consider the question, but Mildred never does. The Cassandra is best when Mildred moves away from her peers, and from Hanford itself. Her visions take place at night, while she sleepwalks through the Columbia River gorge, and in those scenes, the novel takes flight. Shields writes the natural world with clear joy, and she evokes scenes of destruction with horrifying beauty. Crucially, this happens when Mildred is not in control of herself, let alone her story. During the visions, Shields is in charge, not constrained by her protagonist's determined innocence and cheer. For Mildred, it's enough to deliver her warnings. She never reflects on what her conversations ... mean, or what they lack. When Mildred is lucid, on the other hand, she seems to stifle Shields' prose. The scenes in Hanford's dining halls and offices move fluidly, but lack the energy of Mildred's visions. Instead, Shields invests in Mildred's efforts to stay in her friend Beth's good graces, which the reader knows early on won't be possible. The only person who truly likes Mildred is Tom Cat, a sweet, crooked-toothed man who wants to marry her. Unfortunately, he's friends with an obvious predator named Gordon, who wants to marry Beth, torment Mildred, and assert his macho dominance over Hanford as a whole. His storyline coalesces into a neat demonstration of The Cassandra's warnings against unchecked power. Refreshingly, the Tom Cat plot is less neat. Mildred can't stand his desire, though she's no stranger to desire itself. Her failed efforts to accept his love become the novel's murkiest element, and, as a result, its best. It's possible that Shields never wanted murk. Certainly her political goals are clear: The Cassandra is a protest against the atomic bomb, against our desire for knowledge and advancement at the expense of human lives, and against the sexism and classism on which the real-life Hanford ran. By those measures, it succeeds, but not nearly as well as a journalistic or historical investigation of Hanford could have. And as a novel, The Cassandra leaves much to be desired. Because Mildred never truly reckons with the philosophical and emotional problems that her premonitions create, the reader never has to. Because she never truly fights to be heard, the reader never has to listen. By the end of The Cassandra, Mildred is literally and figuratively mute, and we have no reason to be sorry.